What type of application do you have in mind for Robotiq's camera? What industry? Is there some special challenges that you think you'd be facing? @AlexYust , @Ryan_Weaver , I know you guys work more in the technical aspects of projects. The camera is targeting simple pick and place on 2D vision application. 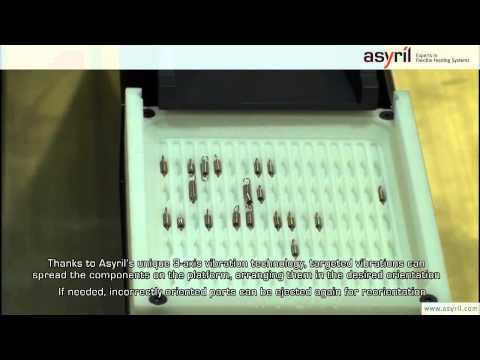 I have seen some clients looking at bin picking and I would like to see a combination of a device like the products from Asyril with the Robotiq camera to see what the results are. I think that would be a really good fit and could solve some of the bin picking applications that some clients have been looking at! Also Very flexible solution as well. I think Olympus and Axis NE are distributor of Asyril, any videos or feedback you can share? Like @Alexandre_Pare said, the Robotiq wrist camera is generally used for 2D (x, y, θ) pick and place applications. More emphasis on the pick rather than the place. For future reference I would like to see a software update for the wrist camera that could do 1D and 2D barcode scanning. Located in Metro-Detroit we are seeing increased barcode reading/scanning applications by the Big 3 (GM, Ford, and Fiat-Chrysler) and other automotive suppliers. Manufacturers want to adopt real-time inventory management, part inspection, and tracking solutions that are easy to use. @Alexandre_Pare - pairing an Asyril feeder with the Robotiq camera could be a great way to make part presentation to the camera more consistent. Since the feeders can use a strong backlight, they would create good contrast for the parts. A common feature seen with Asyril feeders is customized "pockets" or "channels" that the parts are vibrated into. That way the camera really only looks for presence/absence, and the robot already knows how to pick a part when one is there. It is important to keep in mind the added cost of using a feeder - without factoring in programming and integration time, it is 3-4x the cost of the camera. Thanks for the tips. I understand that sometime adjusting the mechanics and vibration of the feeders can be lot of trial and error to get it exactly like you want. It is also nice to get some ball park ideas of prices. @Ryan_Weaver I just took a look at some of the Asyril videos and I have a couple of applications in mind where we could potentially use a flexible feeder like this but have a question, is the feeder table only loaded manually or can you have a bulk hopper feeding the table? @ryan_weaver what kind of pick speeds can the system handle? Based on a project in the past, the pick speeds of such a system will depend on how many pick candidates you can get in the vision Region of Interest. What we had was a vibrating conveyor that would start from a single bin location and split out into tracks. Vibration motor was hooked up to a digital IO of the robot. The robot would take a picture, if it could not find pick candidates in the ROI, it would turn on the vibration. This was repeated until candidates were found. For this system we used a Fanuc M3 robot (so really high speed motion), with a Cognex camera and we were able to reach approximately 0.65ms per pick and had approximately 5 pick candidates per images that we took. So every actuation of the vibration would bring about 5 candidates within the vision ROI. We had to play a lot with vibration parameters to get as many candidates as possible as fast as possible in the vision ROI for picking. It was really dependent of the size of the parts and the way they behaved to vibration. The main adjustments that we made were adjusting the inclination of the conveyor, balancing the vibration motor, adjusting the vibration frequency and changing the shape of the transition from the single bin location to the tracks.